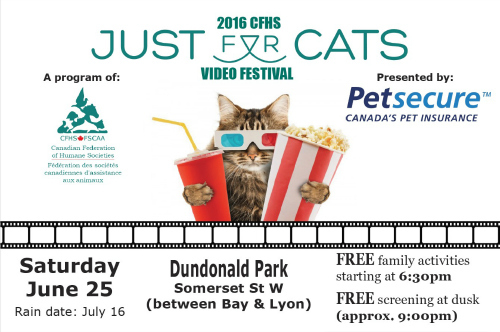 Centretown Movies is happy to be partnering with the Canadian Federation of Humane Societies to present the Just For Cats Film Festival Night in Dundonald Park on Saturday June 25th. It is the only national festival dedicated to celebrating cats, an exclusive screening of the best internet cat videos on the planet, cat-inspired yoga, live dance and more! Family-friendly activities start at 6:30pm and run until we start the Just for Cats reel at dusk. Suggested donation of $5-10 per person. Proceeds benefit the Ottawa Humane Society and the Canadian Federation of Humane Societies. Remember to bring a picnic blanket or lawn chairs for your comfort. In case of rain, the event will be rescheduled to July 16. The CFHS Just for Cats Video Festival is now in its third year! This expertly-curated reel of internet cat videos is shown in communities across Canada to raise money for cat welfare programs that improve the lives of shelter cats while they await adoption, ensuring better feline health and higher adoption rates from coast to coast. Since its inception in 2014, this festival has raised $231,035 for Canadian cats! A big thank you to the Marquee Sponsor, Petsecure Pet Health Insurance, for supporting this project so generously and helping to save the lives of cats across the country. Visit petsecure.com to find out more about their commitment to feline health and welfare! I’m looking forward to this event! Excellent cause!